We drove along the Bow Valley Trail between Cochrane and Canmore enjoying the autumn colours that are really incredible this year. Between Ghost Lake and Morley is the McDougall Unite Church which is 135 years old. It is a prairie icon in Alberta and served its role as a contrast to the yellows and a point of focus admirably in this image. I posted an image of this same church earlier this year in June. I hope to post more fall images showing how special this year in particular is. This entry was posted on September 26, 2010 by Christopher Martin. 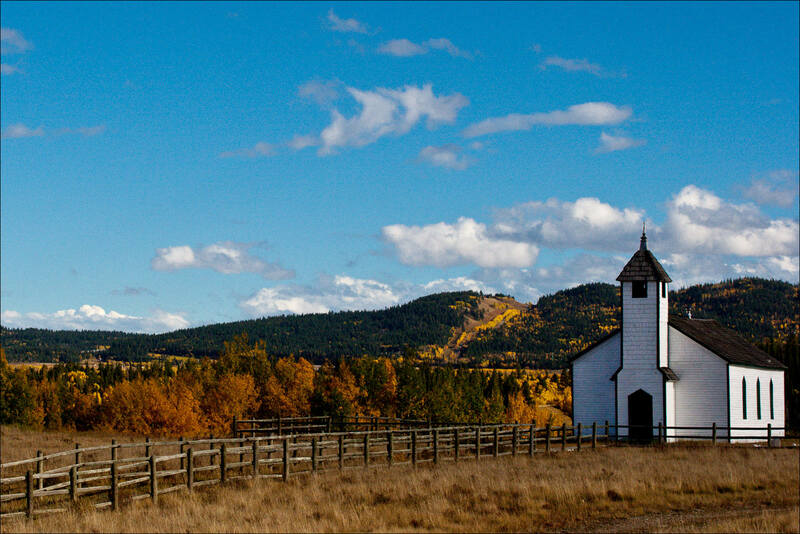 It was filed under Autumn, Cochrane, Landscapes, Outdoors and was tagged with alberta, autumn, church, cochrane, faith, fall, fence, images, landscapes, photograph, photographer, photography, religion, united church. Chris.. I like this. Nice leading lines..nice old church with impact…good landscape. Nice job. Hi Dave, thanks for your comments. How is autumn looking in your area? Just beautiful! I love it when the trees start to change colour, it gives such a magical feel to the landscape.